A rather large Nicholson's pub tucked away in a tiny alley off a lane in the City, very near Ye Olde Watling, another Nicholson's pub. 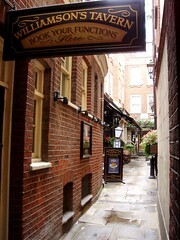 Approaching up the inconspicuous alleyway (shared with a Jamie's wine bar) will usually present the visitor with large groups of City office workers gathered outside, smoking. There are a few small tables for this purpose, but the crowds spill over onto the steps and down the alley. Once inside, there are two large rooms, the first thin and long, and the back room spacious with plenty of expansive tables (some long and some round), with banquette seating around the back walls. Though it gets very dark even in Summer, this usually means there are tables available even when the pub is busy. There's another downstairs bar (Martha's Bar), which can be booked for functions, and which has its own full-size bar (including two handpulls for ale). The bar upstairs stretches between the two rooms, with six handpulls near the front and five more at the back. There's a range of constantly changing guest ales, with London Pride (£2.50/pint) and Adnam's Broadside (£2.75) advertised on a poster as the regulars. In December 2011, Doombar was on for £3.40. In June 2009, Timothy Taylor's Landlord (£2.90), Sharp's Honey Spice (£3.05) and Newman's Spring Cottage Biscuit (£2.90) were also available, at very reasonable prices for the area. Additionally, the prices are marked clearly on all the handpumps. Apart from these, a range of regular draught lagers are available, as well as Addlestone's cloudy cider. Food is served all day, and appears to emphasise fish dishes (they have a range of options, with availability marked up on chalkboards around the walls), although a range of standard pub food (burgers, pies and the like) is also available. In June 2009, Ewan had a vegetarian burger (£7) with extra cheese and mushrooms, which was perfectly decent, maybe a little dry, and served with a good number of chips. In December 2011, Kerry's roast chicken was a good size (if also a little dry). Ewan's verdict: Despite getting predictably busy at peak times like Friday evening, this is a fine Nicholson's pub with a good range of ales, and as good a choice as any in the area. Last visited by Kerry and colleagues, 9 December 2011. Last edited 2013-05-10 08:17:06 (version 5; diff). List all versions. Page last edited 2013-05-10 08:17:06 (version 5).